Taco found a new home! Regram from @monamyf. Adopt-a-taco from #MagicPony magic-pony.com and let the summer adventures begin ☺???? The gallery and collectibles store Magic Pony has opened a Japanese-themed pop-up for the holidays. Tokyo Pony is filled with super-cute playthings that would make unique gifts for kids or adults, like patterned soup bowls, colourful enamel pins and limited edition toys from artists Takashi Muramaki and Yoshimoto Nara. We’re particularly fond of this large stuffed taco named Flaco. Until December 24. 2104 Dundas St. W., magic-pony.com. The city’s go-to gift shop is hosting a special shopping event this Saturday (the last one before the big day). The pop-up, which is right across from the store’s Queen West location, will offer the brand’s signature holiday items—adult onesies, quirky tree ornaments, playful socks—at a 40 per cent discount. There will also be seasonal arrangements from west-end florist Sweet Woodruff, live music from Wild Rivers and treats from the Drake café. Saturday, December 19. 2 Abell St., facebook.com. TKVO is an oddly medical acronym for a boutique (it stands for “to keep vein open”), but it’s a gold mine of giftables. Calling the store a “safe space,” owner and artist Tate Sameshima showcases queer photography, and stocks gender neutral clothing and niche magazines like Protein and Gayletter. The common thread, though, is design: the place is brimming with beautiful objects—whether it’s geometrical jewellery, graphic stationery, floral-patterned bow ties or delightfully quirky candles. 1450 Dundas St. W., 416-536-8586, tkvolife.com. The owners of Northwood and Northern Belle have opened a cutesy boutique on Bloor West. Northwood General Store is full of gift ideas for every type of Torontonian, including the wilderness-loving cottager (camping-themed postcards, maple syrup–scented candles), the picky city girl (minimalist gold-faced watches, leather totes), and, of course, the coffee-and-cocktail snob (pour-over kettles, copper flasks). 800 Bloor St. W., northwoodgeneralstore.ca. Kyle: bomber jacket, snap button closure, graphic lining. French terry modal. Miik Men, an offshoot of the local womenswear label that launched earlier this year, specializes in sustainable, simple basics. Everything’s crafted in Canada from a blend of ethically sourced bamboo, tencel and organic cotton—a mix that’s extraordinarily soft yet still manages to hold its shape. The collection includes comfy button-downs and blazers, so guys can look sharp while basically sporting sweats. 993 Queen St. W., Suite 301, 416-673-1200, miikmen.ca. Sift is a collaboration between local makers Rice and Potato Workshop and the vintage label Valiant Bob. Part thrift shop and part antique haven, it’s scattered with upcycled chests and old picture frames alongside racks of 1960s-style ties and rows of china teacups. 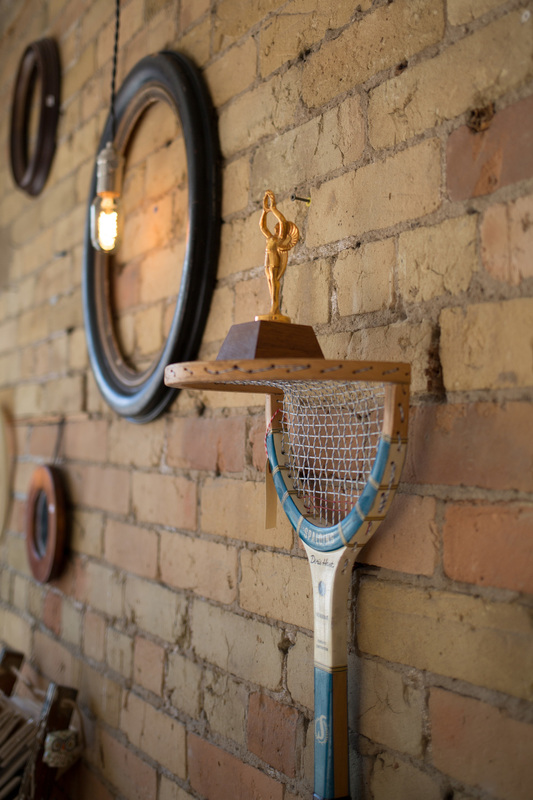 The coolest find, though, has to be this old-school tennis racquet that’s been fashioned into a trophy shelf. 246 Queen St. E., 647-464-9769, siftvintage.com. Perfectly printed dress & #charmedarm from @britandrus! #regram #fanphoto #ALEXANDANI #charmedarms #withlove #armcandy #wristgame #positiveenergy #bangles >>> Shop this look by clicking the link in our profile! Fans of jingly wrists, rejoice: this Friday, American accessories label Alex and Ani is opening a Toronto flagship, bringing its popular line of charity-supporting charm bracelets, which have been sported by celebs like Beyoncé, north of the border. The shop will be rife with pseudo-spiritual inspiration, like the Zodiac’s celestial wheel, Arabic symbolism and, of course, lots of healing crystals. Most pieces cost less than $100. 301 Dufferin St., 416-256-2811, alexandani.com.